One of the most famous people to come out of Prince George's County was back home Thursday to be celebrated with a parade. 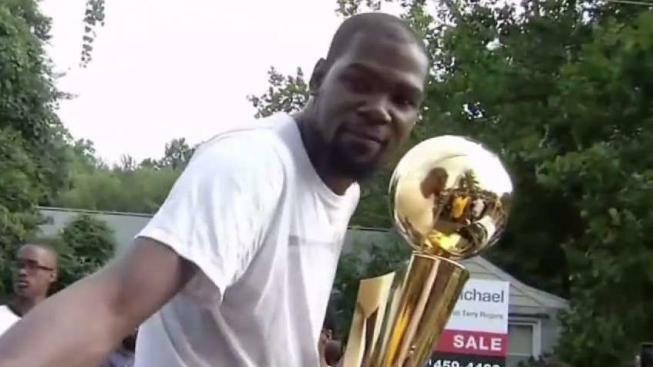 Kevin Durant Day officially kicked off at 10 a.m. with a parade in Seat Pleasant, Maryland. The day celebrates the accomplishments of the NBA All-Star, who was born in Suitland. He rode in the parade in a silver Corvette, greeting fans of all ages and hoisting the NBA championship trophy and signing autographs. Prince George's County's own Kevin Durant rode in a silver Corvette Thursday morning for Kevin Durant Day. A huge crowd of people of all ages went to see him and the NBA championship trophy. News4's Justin Finch reports. 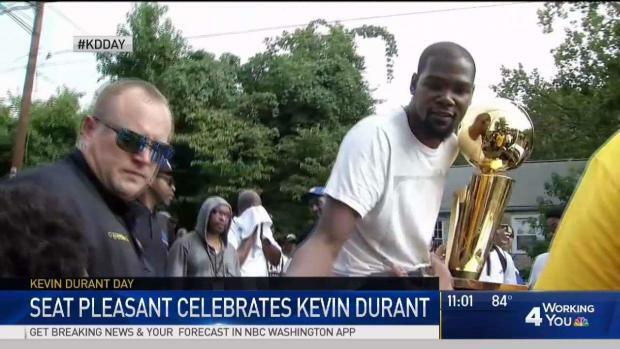 Seat Pleasant Mayor Eugene Grant said locals were honored to see Durant return. "We're very excited that Kevin has not forgotten from whence he's come," Grant said live on News4 early Thursday. One young fan said he sees Durant as a role model. 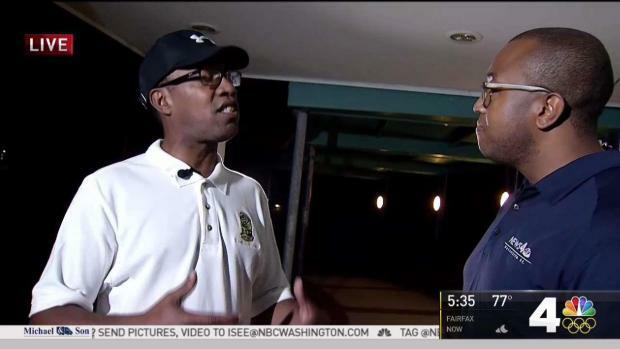 The mayor of Seat Pleasant, Maryland, talks with News4's Justin Finch early Thursday ahead of the Kevin Durant Day festivities. "It just goes to show that people from your hometown can make it," he said. Durant's mother, Wanda Durant, said the children who went to see the star reminded her of her own son. "When I see these little kids and these teenagers, I see my sons, and I see Kevin," she said. "It's quite rewarding to be here and see them looking up to my son." Here's the Kevin Durant Day parade route, from 10 to 11 a.m. Thursday in Seat Pleasant, Maryland. "I'm just excited because it's one thing for him to come to his hometown and bring the trophy that he one," Seat Pleasant resident Warren Johnson said. "It's so proud to a lot of people." "I would tell him to ignore all the negative comments, and keep it moving, and praise God he's gotten as far as he's gotten. Amen," said Roslyn Wise, who took off work to be there. More than 20,000 people were expected to attend. Seat Pleasant, Maryland is honoring its former resident, basketball player Kevin Durant, with Kevin Durant Day Aug. 17. NBC4 will sponsor the event, which will take place at Goodwin Park. News4's Sherree Burruss spoke with Seat Pleasant mayor Eugene Grant to get the details on the celebration. Durant has donated almost $1 million to the community, Grant said. The funds have gone toward basketball courts and the gym where Durant got his own training, the mayor said. "I think it was something that I instilled in my son," his mother said. "He's building his own legacy now, so yes, it's just important for him to give back." 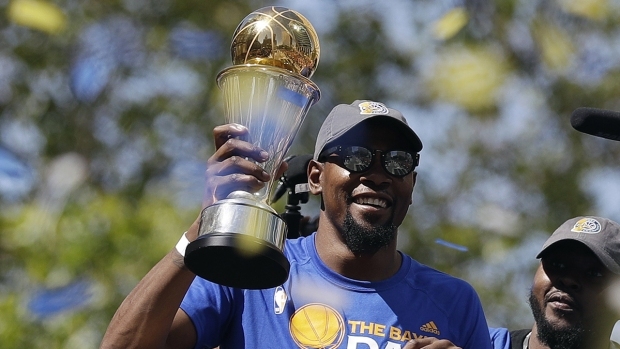 Durant helped lead the Golden State Warriors to an NBA championship in June, defeating LeBron James and the Cleveland Cavaliers. The parade began at Goodwin Park.